This year, although my meal was what most would call “traditional,” I took a lot of risks for this group. 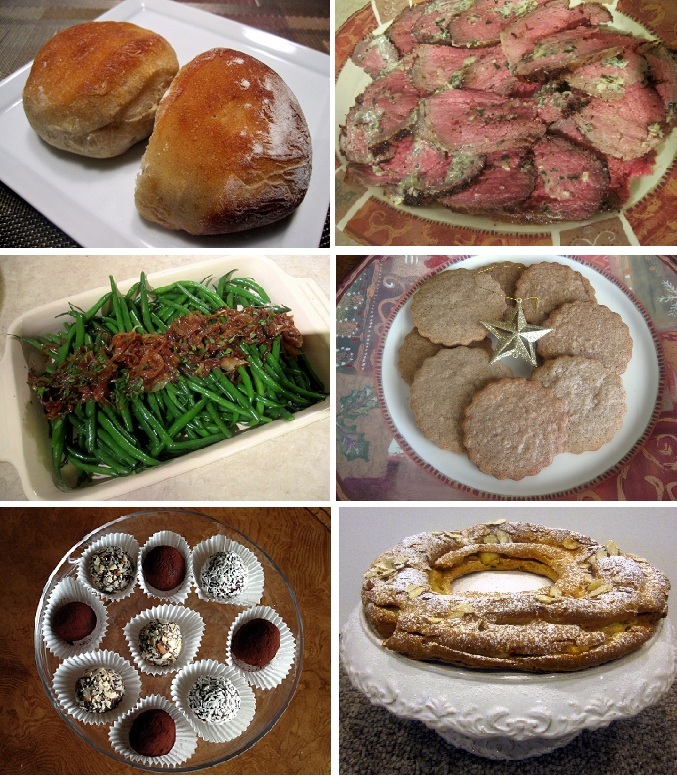 Each item had the potential to perturb the palate of someone. But there was one thing that brought everyone together — one thing that made everyone overlook that the rolls were crusty and homemade and not from the Pillsbury package, eat up the perfectly cooked roast that was medium-rare when they would have preferred medium, forget that they don’t like cauliflower when faced with cauliflower gratin, kindly scrape the caramelized onions off the green beans without making a fuss, accept that the brown butter fingerlings weren’t mashed and covered with gravy, pretend to understand what a Paris-Brest and Speculoos were, lap up the Eggnog Ice Cream Tartufi even though they stay away from frozen dairy, and skip the snide remarks when offered truffles with a higher % cacao. Phew. Cheese straws saved the day. Yes, a humble cracker made the meal for many of us and served as the perfect accompaniment to my salad, because it distracted my grandparents from the presence of almonds and mesclun. 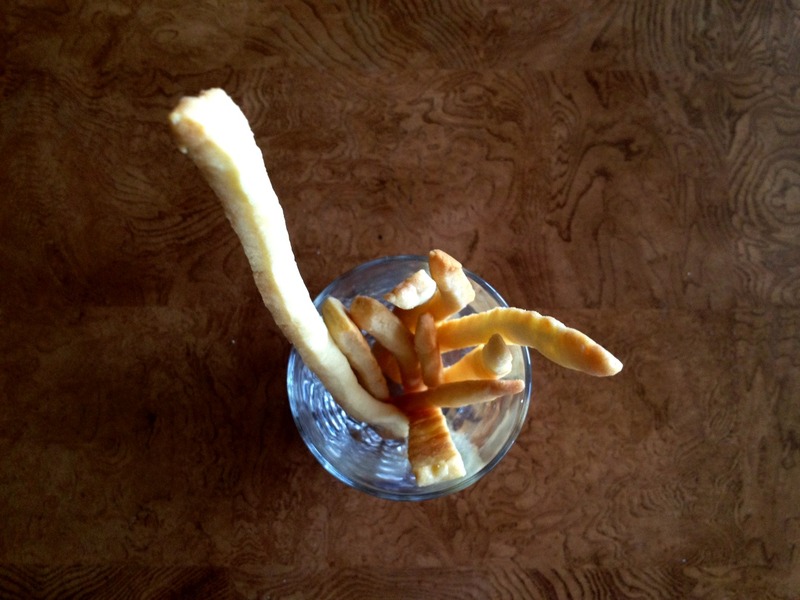 Apparently, the cheese straw ia a southern specialty, but it will now stand tall in a glass whenever I have company. 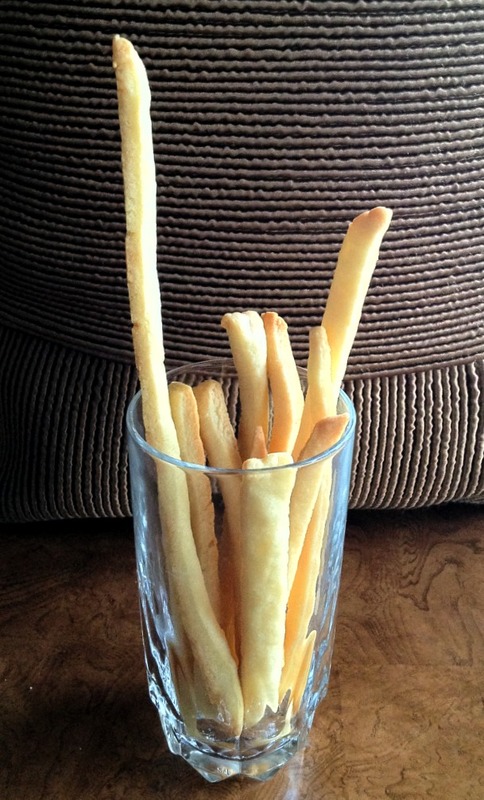 These buttery, cheese-packed, surprisingly flaky, crisp cracker sticks are easy and a blast to make. They’re customizable and dangerously addictive. I recommend not baking them perfectly straight. They look beautiful slightly wavy and crooked. Fun and festive, they’d be the perfect addition to a New Year’s Eve celebration. You’ll never touch a supermarket “cheese-flavored” cracker again. In a food processor, combine the cheese, butter, flour, salt, red pepper (or any other herb or desired seasoning) in five 5-second pulses until the mixture resembles coarse crumbs. Add the half-and-half and process until the dough forms a ball, about 10 seconds. On a lightly floured surface, using a lightly floured rolling pin (I’d go with a lightweight French pin — this dough is a dream to work with and quite soft), roll the dough into an 8- by 10-inch rectangle that is 1/8-inch thick. 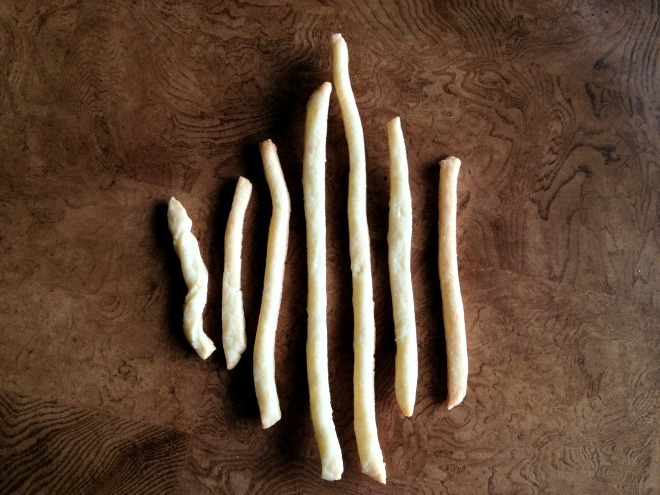 With a sharp knife , cut the dough into thin strips (I like crooked waves) of any length , each 1/4- to 1/3-inch wide (dipping the knife in flour after every few inches ensures a clean cut). Gently transfer the strips to a parchment lined baking sheet, leaving at least 1/4-inch between them. The dough may sag or may break occasionally in the transfer, but don’t be concerned — just do your best. Serve at room temperature. Cheese straws will keep in the refrigerator, in a sealed container, for two days (I’m still eating them after making them on Christmas eve and storing at room temperature and they’re just fine). *You know those cheese snacks that don’t really taste like cheese? You went to all that effort to get a nice cheddar, so you want to taste it. Go for the sharpest cheddar you can find. Your Grandparents sound like my parents. :/ Your food looks so good! Everything looks amazing! And cheese straws are definitely something I need to make. Hope you had a wonderful holiday! Sounds like you were up to the challenging task!! What a great menu, too. Cheese has a tendency to bring everyone together :) Happy New Year!